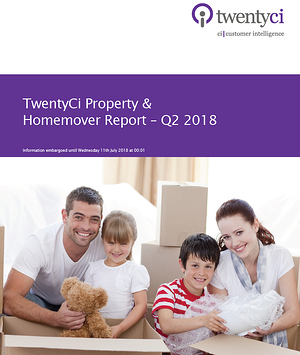 TwentyCi recently launched their Property & Homemover Report: Q2 2018, the fifth edition in a quarterly series of reports featuring data and analysis for the whole of the UK property market. The reliability of the report is testament to the strength of our comprehensive UK Homemover data, compiled from the most robust property change sources available – providing a real time review of the UK market and covering 96.6% of all property moves (both sales and rentals). Confidence is still building. With new instructions up nearly 7% year on year, house prices remain stable with no significant discounting. Online agents are on the rise. Online estate agents now represent nearly 8% of all exchanges, an increase of 13% from Q1 to Q2. London remains an enigma. London continues to operate its own unique property ecosystem. The average asking price is up 3.1% in Q2, an increase seemingly generated by a lack of available properties. Smaller homes are the biggest sellers. Terraced and semi-detached houses continue to make up the largest proportion of property sales, accounting for over 55% of all exchanges. The Silver Economy is going from strength to strength. Baby boomers’ appetite for property continues unabated, with exchanges up 10% year on year. Realised prices vary by value. A review of 2017 listed prices compared to the price actually achieved shows an average discount of up to 4% for properties sold for less than £1m. The realised value of properties over £1m, however, shows an average discount of 8%.